I've had my KSC-50 headphones for roughly six years and I have several pairs of KSC-75 headphones that I own that range in age from six months to over a year. All of the KSC-75s have developed an annoying buzz in the right ear and show a steady decline in audio quality. The KSC-50 headphones, however, still sound wonderful when compared to the KSC-75. When you are reading reviews of this headphone you are probably looking for an inexpensive but excellent sounding portable headphone, if this is the case then read on! I own and compared 4 portable headphones that I own. The Koss KSC-35 which is still available and not discontinued as is often mentioned (it’s 2005 as I write this review), the now discontinued Koss KSC-50 (which is succeeded by the KSC-75), Koss KTX-pro1 and Sennheiser PX-100). These are all relative cheap headphones (max $40.-) and absolutely the best value in headphones UNDER $100.- including the in-ear types such as ‘Koss The Plug’. The Sennheiser PX100 takes 4th place. This headphone has a lower sensitivity (99dB/1mW (@32 Ohms = 114dB/1Veff) than the Koss headphones but one must keep in mind that the impedance is of importance here because when a voltage is applied that dissipates 1 mW into a 60 Ohm headphone the PX100 will produce a sound level of 101.5 dB with this same voltage. In practice this output level will most likely be somewhat lower because each headphone amp has a certain output resistance varying with make and model over which a part of the available voltage will fall. This sensitivity is enough for portable players with only 1 or 2 batteries (this mostly determines the available output voltage together with the output resistance of the headphone amp) to be able to drive these headphones loud enough. 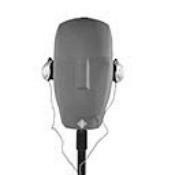 Most headphones do NOT have such a high sensitivity (higher impedance), which is a must for portable equipment. The sound is pretty good and open but a tiny bit ‘muffled’ and not as ‘open’ when compared to the 3 Koss headphones. The PX 100 has low distortion and a ‘flat’ (meaning no excessive peaks or dips) frequency response with a gradual decline of the highs translating in less ‘clarity’ and ‘openness’. The fit is comfortable because the elements can tilt in any direction and will therefore perfectly adapt to the shape of your ears. The foldable PX100 comes with a rather big but sturdy carrying case. The PX100 feels a bit flimsy because of it’s foldable design but is sturdier than it feels and has a nice look to it. The cord, however, is very thin and feels as it may break easily. 3rd place goes to the Koss KTX-pro1, which has the highest sensitivity (103 dB/1mW @ 60Ohms) and an extra volume control in the cord. The sound quality is overall somewhat better then the PX100, more open and more probnounced lows (maybe a tad in the direction of being boomy) and ‘cleaner’ and ‘crisper’ highs and equally low distortion and falls of a little in the highs too like the PX100 making it sound a tad boomy. The looks of this headphone do not appeal to me as much as the Sennheiser does. The cord is thicker and the headphone feels more solid because it is not foldable but the fit is the worst of the 4 headphones because the elements can only tilt in one direction and therefore put more pressure on the back of the ears than on the front which may be uncomfortable after a certain time. 2nd place is for the Koss KSC50 (101 dB/1mW @ 60Ohms), which sounds better than the KTX-pro1 and PX100 especially in the highs where it is superior and more open and flat. The bass is less pronounced than the KTX-pro1’s. The earclip design takes some getting used to but is actually much more comfortable than headband headphones because these headphones do not press your ears against your head they also do not fall off your ears you can even jog with them. The Koss KSC35 (101 dB/1mW @ 60Ohms) is the winner because of it’s comfortable fit over the ears (probably the new KSC75 will fit equally well as the KSC35 not yet tested). The KSC35 is soundwise (almost ?) identical to the KSC50 (the same driver). Although the KSC50 feels sturdier than the flimsy feeling KSC35 I prefer the KSC35 over the other headphones in fit, tonal quality and openness and comes much closer to my Sennheiser HD650 which I regard as a reference headphone. Sennheiser: HD400 HD414 HD497 HD250-II HD580, HD590, HD600, HD650, PX100, Koss: KSC19 KSC35 KSC50 KTX-pro1, The Plug, Beyerdynamic: HD330, HD770, HD880, HD990. Stax electret headphone, Sony and Technics earbuds and various other cheap and more expensive headphones. Great clear open transparent punchy detailed lively sound for $20! Some headphones may sound fuller,but then theyre usually veiled sounding,and really ;what do you want for $20? I think the product model year is 2002,but it may be otherwise. The Koss KSC 50 and KSC 55 are the same headphones,except the 55 clips to each ear individually,and the 50 is a headband type. Im actually listening to David Sanborn on the KSC-55 right now as im wring this. (CD Player is a Sony C-J01). The sounds in the backround arent smeared in the rest of the music. Drum rim shots are crisp and have snap,bass is taught and extends down nice,lots of detail,open,lively. Ive compared them to many headphones,and in the under $30 range,i really dont think anything can touch it. Itll give some headphones up to maybe $80 a run for its money. Might not totally wipe the floor with them,but may make you wonder if you should spend another $60 for them. If i did upgrade it would be for Grado 80's. (About $95). But really,you should like these,especially for $20. Ive also seen them in Circuit City. Get the KSC-50 though,because the earclips on the 55's can be uncomfortable after awhile i think. Check them both out. Sony MD301($39),,Fostex T-20(about $80-$90),,Sennhiesers(some $49 pair my sister has)Sony ear buds,Grado 60's,,80's,,etc. The whole package--can't say enough. They do take a little getting used to Gumby-like ear clip before they are comfortable on the back of the ears. Koss has improved this in newer versions. Also, the cord of the first pair I owned was covered in cloth and did not hold up well to tangling and kinking. The second pair has a rubber coating on the cord which seems to resist seems better. These phones are hands-down the best portables I have heard. The bass is very clear, thight and detailed as is the treble. The midrange is clearer and more articulate than almost any small portable I've used. I am on my second pair in just over a year and Koss has made someimprovements recently to both comfort and functionality (see below). One caveat: don't exect to listen to tons of bass at high volumes because they will begin to distort in the low end at very high volumes. These were made for those that care about how portable audio sounds and not for how loud you can get it. After reading a review of this product from a self-described "audiophile" I decided to buy it on ebay. It has been one of my better low-end audio purchases. The sound quality is very impressive and the unit is very comfortable on the ears. Sure beats the junk headphones that come with most portables.